Remark: Please watch the video, so that you'd know what to expect out of the Alpha 2 Release. You're ready: make a gesture, make Neo change its screen orientation (if you did watch the video, you'll know what to do). Select a gesture, press Train, and follow instructions. Remark: On the 2008.8, your missing dependencies will be downloaded automatically by the installer. 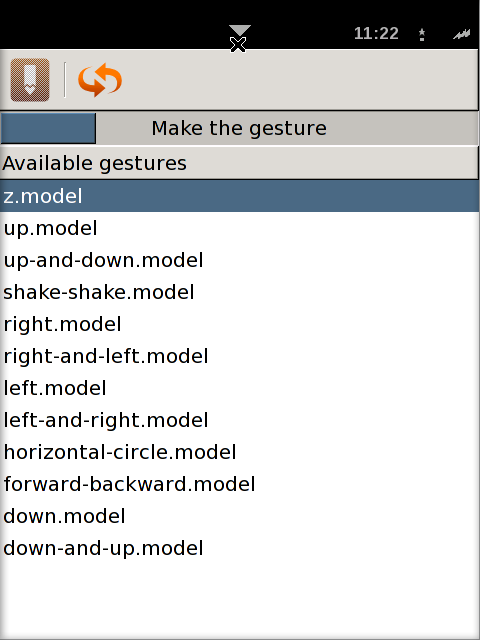 Select a gesture and click the first icon on the toolbar; Follow the instructions. Do the same for all the gestures! 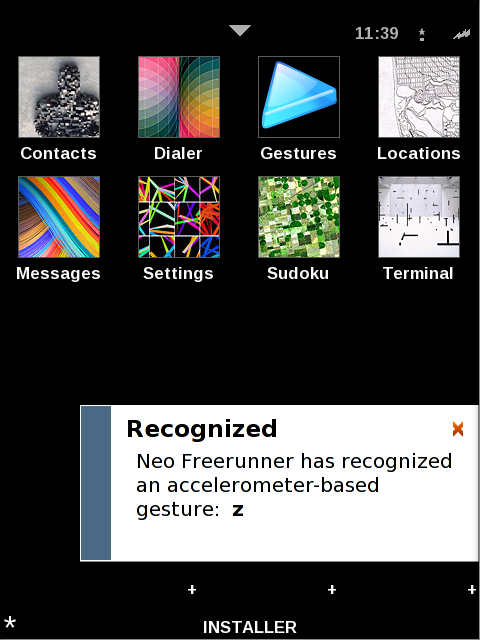 Remark: You have to restart the Gesture Recognizer, so that it will re-read the newly trained gestures. Every time you train one or more gestures, restart the recognizer! Check to see which gesture gets recognized most often. Try training those gestures again. 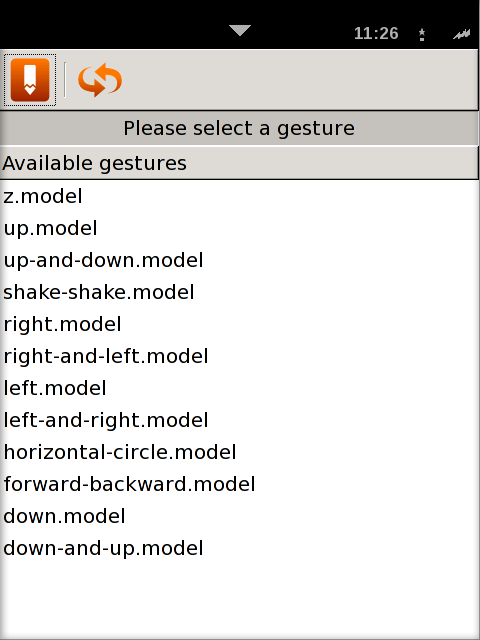 Determine which gestures don't get recognized at all. Try training those gestures again. 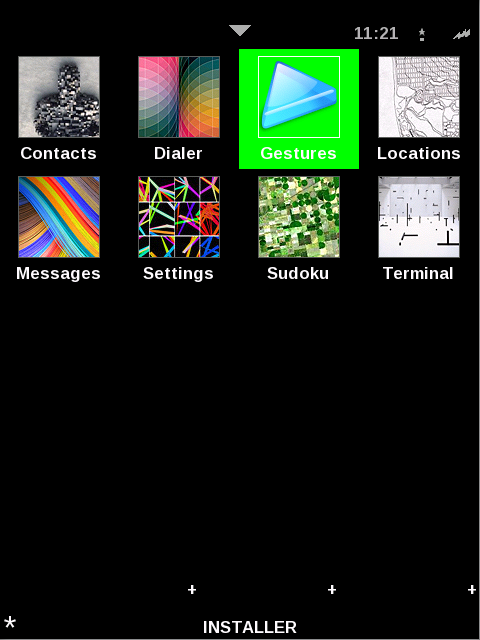 and make a gesture for more information on DBUS. 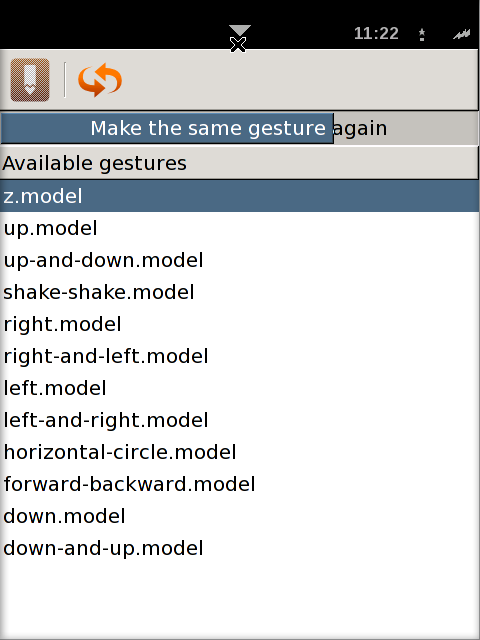 Again, if you modify the configuration file, you'll have to restart the gesture recognizer (gesd). After a while, the accelerometers might stop working. 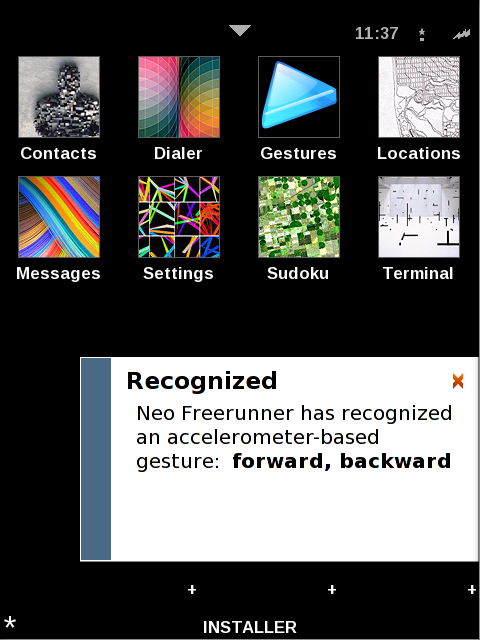 After a while, the accelerometer send bogus values (values that are lower than what they should be). If this happens, the classifier won't be able to classify dynamic/static acceleration, and nothing will work - nor the gesture training, nor the gesture recognition. Vigorous shaking (side to side) while receiving a call could reject it. A sideways swing (90degres) out of the wrist could mean general Cancel/Esc/Back A long swing could close a app (more a arm swing than wrist. Same G-forces but longer time). These swing moves could be used on two axis and each in two axis for different usage. A firm wrist tilt backside down could mean global OK.
Maybe some basic moves like thsese should have absolute global meaning. Mute phone my hitting it on something hard three times with one side.